Special Containment Procedures: Specimens of SCP-955 are to be contained in an outdoor steel screen kennel with a ceiling and a concrete floor that provides for sufficient drainage. The screen mesh should be sufficient to contain juvenile specimens, and the screen should be coated with anticorrosives and regularly inspected for damage. Each kennel shall be of sufficient size to allow the specimens to exercise. It is recommended that each kennel contain a variety of durable rubber or plastic animal toys in order to reduce stress to the specimens. Specimens are to be nourished with 1 to 4 liters of fructose solution per day and are to have free access to clean, fresh water. Personnel are advised to wear anticorrosive protective gear when visiting the kennel area and to avoid inadvertently making threatening movements or startling the specimens. Keepers at Site-34 have reported that playing recordings of soft music and the sounds of childrens’ laughter is effective in reducing anxiety in the SCP-955 specimens housed there. If a specimen of SCP-955 becomes distressed, a keeper should first confirm the integrity of his or her protective gear, then slowly approach the specimen and make physical contact: gently stroking the specimen’s upper thorax or carapace has been shown to soothe the specimen. Description: SCP-955 is a species of arthropod-like land-dwelling creatures native to temperate areas of North America. 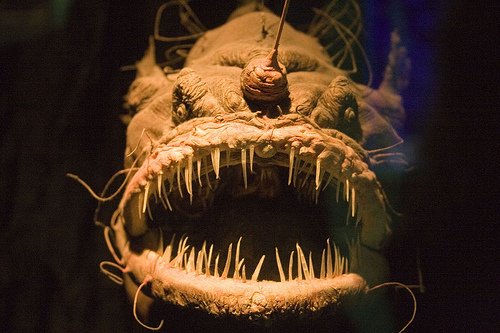 The organisms average between 20 and 200 centimeters in length and feature a bulbous head superficially resembling that of a deep-sea fish, a large mouth with extensive dentition and surrounded by flagellum-like organs, two eyes on crests at the top of the head, a large single antenna-like organ between the eyes, fin-like protuberances near the back of the head, and a long segmented body plan featuring multiple pairs of legs. Juveniles of SCP-955 are a light grey in color, while mature specimens range from tan to black. If startled or threatened, the organism will lift its head and thorax off the ground while emitting a shrieking cry, then project a viscous, sticky, foul-smelling and caustic mucus in several directions from its mouth and protuberances and attempt to flee or burrow into the ground. Mature specimens of SCP-955 are capable of squirting the mucus for a distance of several meters. The mucus is corrosive to metals and most organic materials (including the tissues of living creatures aside from SCP-955 itself), and contains a neurotoxin which makes unprotected skin contact with the mucus extremely painful. SCP-955 appears to possess a level of intelligence roughly comparable to a juvenile dog. The organisms are curious, highly social, playful and attracted to bright colors, high-pitched sounds and sugar. Each of the twenty-three collections of specimens of SCP-955 from its habitat, to date, has occurred when one or more of the organisms has encountered one or more humans, typically in wooded but populated areas, playing fields, schoolyards or similar places frequented by physically active humans. The SCP-955 organisms, attracted by the activity or scents, will rapidly approach the humans while wriggling its facial organs and flapping its fins and emitting a growling or hissing sound—study of SCP-955 behavior in captivity suggests that these sounds signal excitement and a desire to interact with the humans in a friendly or playful manner. When the humans who encounter instances of SCP-955 react with alarm or violence, the organisms will exhibit the threat response behavior noted above. It appears that in the absence of a mucus emission episode, dogs and children under the age of seven generally do not perceive SCP-955's appearance or behavior to be alarming or threatening. Several children who had interacted with an SCP-955 specimen without adverse incident were asked to draw or describe the organism, with the results consistently representing SCP-955 as "cute" or "fuzzy".12 Young children, in particular, have been observed to enjoy interacting with SCP-955, often including maintaining close physical contact with them or handling them. The specimen depicted in the photograph, together with several other specimens, had been encountered by kindergarten pupils at ████████ Day School in Connecticut. The pupils designated the specimens as "Mr. Sillybug and his babies" and introduced them into the school facility where they remained for several days until they encountered a mixed group of pupils and adult faculty, with traumatic results. The diet of SCP-955 in its natural habitat is not known, but there are no indications that it is carnivorous. 1. Dr. Patel speculates that SCP-955 may have some effect that causes young children, as a class, to perceive the organism differently from older children or adults. 2. This effect appears to be an inverse of similar effects seen in SCP-252 and SCP-2662 involving fear and ritualistic devotion respectively.